Tindertop is the PUP that uses misleading techniques to prevent removal. Use Reimage to locate malicious components and get rid of them faster than with uninstall instructions. A full system scan blocks virus reappearance and prevents traffic to malicious domains. On its official website, Tindertop virus is introduced as a software “made with [love] by a bunch of awesome dudes from acround the globe.” Yes, the spelling mistake is there, and it is not the only cue that raises suspicion about this supposedly useful program. 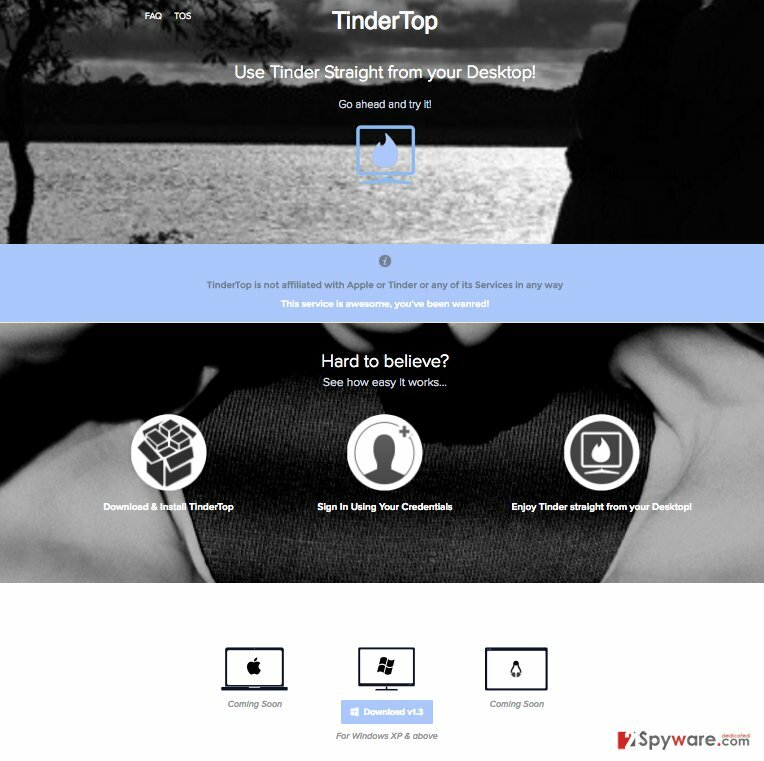 The software initially claims to provide the users with service, allowing a quick access to the Tinder app directly from the computer’s desktop. In other words, it is a mobile app adaptation created specifically for the Windows OS. According to the software creators, Linux and Mac OS X versions are still in the process of developing. Nevertheless, even such slogans like “This service is awesome, you’ve been wanred!” (another spelling mistake here) are not able to hide the suspiciousness of this program. Once it is installed on the computer, it starts carrying out activities that are not reconciled with the user. These activities may involve installing additional software, generating ads and initiating redirects to third-party websites. Such unauthorized processes often go unnoticed, or the users simply ignore them until it becomes nearly impossible to browse the web due to browser slowdowns or intrusive ads. You shouldn’t let your computer reach such a state. Remove Tindertop from your computer as soon as you possibly can. Do it with specialized software, for instance Reimage. Experts label this program an adware-type infection. Though you can download it from the official website, Tindertop hijack is a more common way this ad-based virus gets into the computers. This ensures the software a safe incubation period during which the virus can settle on the computer. Gradually, more and more Tindertop ads labeled “Ads by Tindertop,” “Brought by Tindertop” etc., begin to appear on the infected computer browser in forms of banners, popups, video ads or in-texts. As if that’s not enough, you start ending up on various unfamiliar websites. After a while, you are not even sure of which link or advertisement is legitimate and which one may simply trigger the Tindertop redirect. What you can be completely certain about, though, is that you do not end up on these random pages by accident. The adware creators predetermine these domains and specifically send you to the affiliate sites to boost their traffic. That’s how this freely downloadable software is monetized. If you expect a completely free service, uninterrupted by sponsored ads, take care of the Tindertop removal and start looking for it elsewhere, because this program will not provide any of that. Just as you would normally expect from a legitimate program, Tindertop can be downloaded from the official website. Nonetheless, it does not seem that the program is popular enough for the users to find it online and install in on their computers. So, how does it still appear on your computer? It’s simple. This program is based on the deceptive software marketing technique, simply called “bundling.” This allows the developers to install Tindertop in the shadow of the regular freeware or shareware programs. The third-party applications are bundled in such a way so that they can be seen only through the “Custom” or “Advanced” installation settings. When was the last time you used these settings to install software on your PC? This is a major problem with most users; that is why unintentional installation of PUPs is so common. The first option you have with the Tindertop removal is the manual virus elimination. Our team of experts have analyzed thousands of similar programs and have come up with the best solutions how to get rid of them. Below you will find detailed steps on how to remove Tindertop from your computer and reset your browser so that you can browse the web without the annoying ads flashing all over the place. Also, it is worth checking out the automatic cyber threat removal options as well. There are some really effective software that can deal with Tindertop virus without asking much of your intervention. Making sure the software is running the latest version is also advisable. Here, look for Tindertop or any other recently installed suspicious programs. Wait until you see Applications folder and look for Tindertop or any other suspicious programs on it. Now right click on every of such entries and select Move to Trash. When in the new window, check Delete personal settings and select Reset again to complete Tindertop removal. Once these steps are finished, Tindertop should be removed from your Microsoft Edge browser. Here, select Tindertop and other questionable plugins. Click Remove to delete these entries. Now you will see Reset Firefox to its default state message with Reset Firefox button. Click this button for several times and complete Tindertop removal. Here, select Tindertop and other malicious plugins and select trash icon to delete these entries. Click Reset to confirm this action and complete Tindertop removal. Here, select Extensions and look for Tindertop or other suspicious entries. Click on the Uninstall button to get rid each of them. Now you will see a detailed dialog window filled with reset options. All of those options are usually checked, but you can specify which of them you want to reset. Click the Reset button to complete Tindertop removal process. This entry was posted on 2016-09-15 at 05:55 and is filed under Adware, Viruses. You can quickly scan the QR code with your mobile device and have Tindertop ads manual removal instructions right in your pocket. 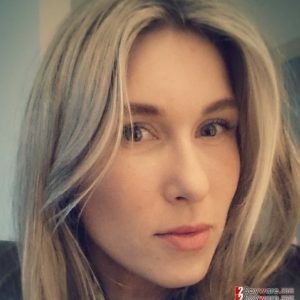 How did you remove Tindertop ads?